In the fall of 1970, a powerful opposition movement emerged in East Pakistan. During the 1971 civil war, a number of factional paramilitary bands, which included communist forces dedicated to a rural-based revolution along Maoist lines, fought against each other and engaged in terrorism. The strongest of the new paramilitary bands, and the one that would have the greatest impact on future events, was organized under the Awami League's military committee headed by Colonel M.A.G. Osmany, a retired Pakistan Army officer. This band was raised as Mujib's action arm and security force. As the political struggle between East Pakistan and West Pakistan intensified, the Awami League's military arm assumed the character of a conventional, albeit illegal, armed force. On March 25, 1971, the Pakistan armed forces launched a campaign to suppress the resistance movement. During the ensuing month, military operations spread throughout East Pakistan. The East Bengal Regiment, the East Pakistan Rifles, and most of the East Pakistani police and their auxiliaries joined the revolt. They seized West Pakistani officers serving with these units and killed some of them. The wholesale, planned defection of the Bengalis from the Pakistan Army in the early weeks of the war came as a surprise to the Pakistani command and was of supreme importance to the Bangladesh cause. The Bengali units, after fighting numerous actions against West Pakistani regulars, gradually withdrew and merged with the Mukti Bahini, providing the essential core of leadership and organizational basis for the rest of the war. Gradually this amalgamation of forces grew into a unified military as it confronted the Pakistanis. Retired officers and troops helped train the revolutionary forces. On April 14, Osmany officially became the commander in chief of the Mukti Bahini. Although most of this force, estimated at over 100,000 strong at the height of the conflict, maintained unswerving allegiance to Mujib and the Awami League, many partisan bands operated independently. East Pakistani civilian members of the resistance operated out of Calcutta. The high command divided the country into eight military sectors, each commanded by a Pakistan Army major who had defected. India granted sanctuary to the Mukti Bahini and provided bases and substantial matériel and training. The initial operations by the Pakistan Army failed to destroy the Mukti Bahini or to prevent its expansion and development, but by late May 1971 Pakistani authority had been widely reasserted. Rebel forces were largely confined to the areas near the Indian border states of West Bengal, Assam, and Tripura. Pakistani forces received reinforcements and the assistance of an internal security force called Razakars (Keepers of Public Order) and other collaborators that had been raised in East Pakistan by the Pakistani administration. Denounced by the resistance for collaborating with Pakistani authorities, most Razakars were Urdu-speaking Muslims who had emigrated from the Indian state of Bihar at the time of partition. The weary Pakistani regulars, however, were able to contain a July monsoon offensive by the Mukti Bahini. In response to Indian military incursions into East Pakistan in late November, Pakistan launched a series of preemptive air strikes against Indian airfields on December 3, 1971. Indian prime minister Indira Gandhi then ordered national mobilization, and Indian forces launched a full-scale invasion of East Pakistan the next day. The initial Pakistani air strikes had been ineffective, and the Indian Air Force attained air superiority within the next twenty-four hours and held it. The Pakistan Air Force detachment in East Pakistan was destroyed, and supply and escape routes were cut off; in West Pakistan the Indian Air Force systematically struck aircraft and airfields, base installations, communication centers, and troop concentrations. At sea an Indian Navy task force immobilized East Pakistani port facilities and landed an amphibious force to cut off escape routes to Burma. At the same time, an Indian task force contained Pakistan's fleet and bombarded port installations at Karachi, West Pakistan. On the ground the Indian strategic plan was aimed at East Pakistan as first priority, while simultaneously containing West Pakistan. 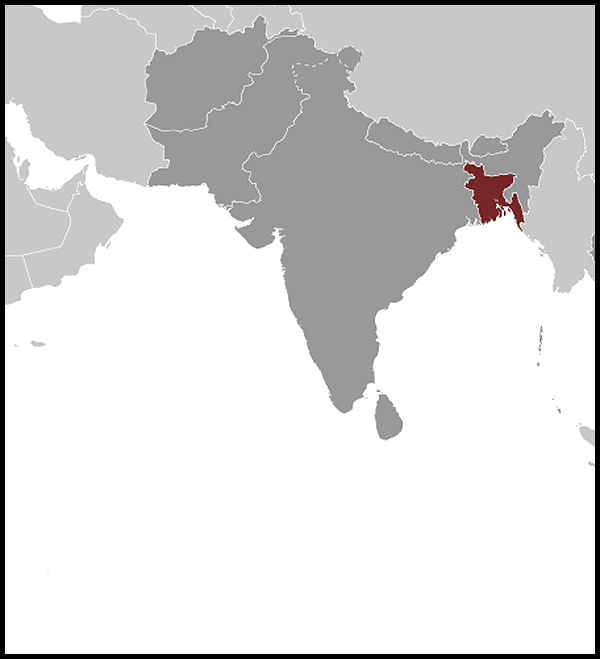 The Indian force that invaded East Pakistan consisted of nine infantry divisions with attached armor units and supporting arms. 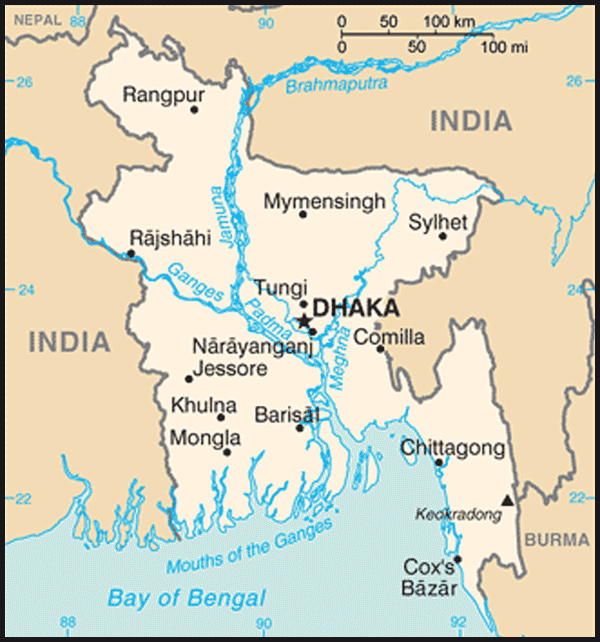 Separated into five invasion columns, Indian forces advanced rapidly, bypassing intermediate cities and obstacles and pressing relentlessly toward the capital at Dhaka. At the same time, guerrilla attacks intensified, and at least three brigades of the Mukti Bahini fought in conventional formations with the Indian forces. Overwhelmed by the speed and power of the Indian advance, Pakistan's four divisions and smaller separate units fought a number of hard actions but soon had their escape routes cut off and were without air support. On December 16 Dhaka fell, and Pakistan's commander, Lieutenant General A.A.K. Niazi, with about 75,000 troops, surrendered to Lieutenant General J.S. Aurora, the Indian commander of the combined Indian and Mukti Bahini forces. On the western front, India's forces had effectively contained Pakistani attacks and had made limited advances into West Pakistan.